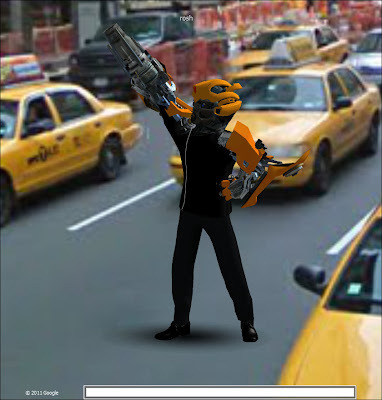 Autobots, roll out! In collaboration with , a virtual goods licensing, marketing and distribution company, we have released wearable head and arm parts of Bumblebee, one of the main characters in the Transformers movie series. 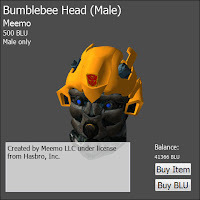 Now your avatar can become "more than meets the eye..."
Meemo, who obtained the rights from toymaker Hasbro to produce and sell virtual goods based on the Transformers movie franchise, has teamed up with Avatar Reality to release wearable body parts of the character Bumblebee. There are 3 parts: Head, Right Arm, and Left Arm, each being sold for 500 BLU. Click on this avatar Blink for the male version, or this one for the female version. When Blue Mars Mobile launches and the Bumblebee avatar shows up, tap on the Item List tab on the right-hand side. Tap on any of the 3 Bumblebee parts to check out and purchase. Tap Search on the bottom menu tray, and tap Search by Item Name. In the search window, enter the keyword "bumblebee." When Blue Mars Lite launches and the Bumblebee avatar shows up, look on the Item List on the right-hand side. Double-click on any of the 3 Bumblebee parts to check out and purchase. Click on the Item Search icon on the top menu bar, or select Window > Item Search. When the search window opens, enter "bumblebee" in the Keyword field.